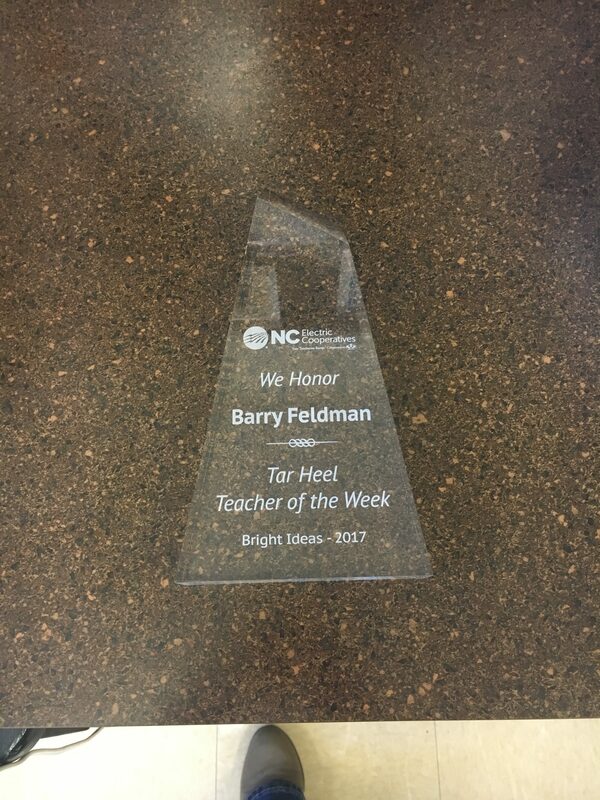 Barry Feldman, Central Haywood High School’s Agriculture teacher, has been named the Tar Heel Teacher of the Week. 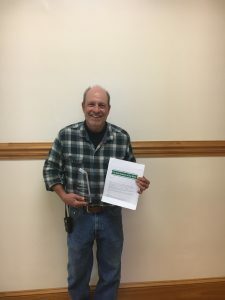 The Bright Ideas Coordinator, North Carolina Association of Electric Cooperatives, Safaniya Stevenson is pleased to honor Mr. Feldman for his outstanding work in the classroom and as a Bright Ideas education grant winner. This program is sponsored by Haywood Electric Member Corporation and North Carolina’s electric cooperatives and recognizes 25 of the most exceptional teachers from across the state during the 2017-2018 school year. 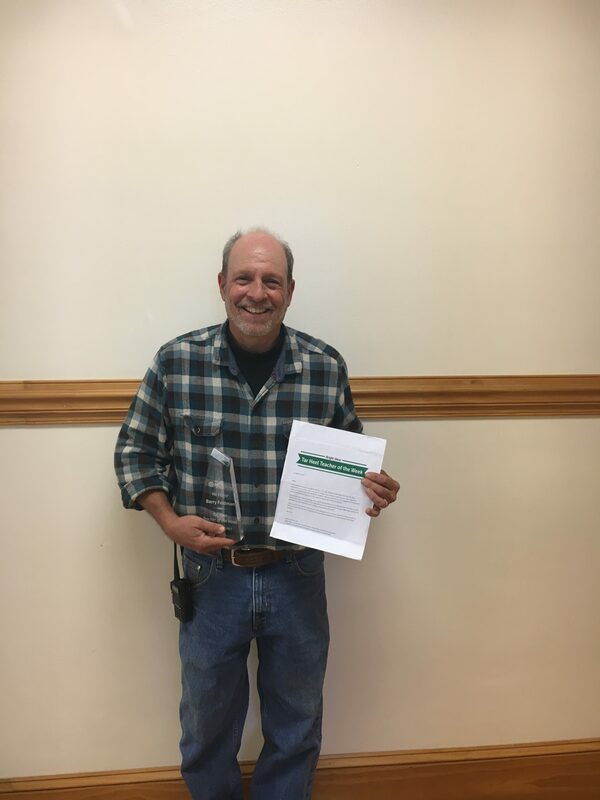 Mr. Feldman is a two-time Bright Ideas grant winner and creative agriculture teacher in Haywood County. “We chose Mr. Feldman because of his dedication to his school and his students’ education.” said Ken Thomas, Manager of Marketing and Communications at Haywood EMC. “He is a hands-on teacher who loves what he does.” Mr. Feldman is very pleased to be awarded the grant and the staff is proud of his hard work. “I feel very fortunate to receive this award for my students at Central Haywood High School. They are the beneficiaries of the grant to highlight their agricultural experiences.” The grant involved two projects which will come to fruition over a two-year period. The first project involved the building of raised bed gardens to highlight individual plant themes. The second project will have the students building a “Riparian Habitat” to create a wetlands ecosystem at the greenhouse compound area. 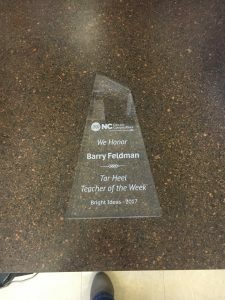 Mr. Feldman and his project will be recognized Saturday, October 21 during the radio broadcast of the UNC vs. Virginia Tech game. The Bright Ideas education grant program strives to improve education in North Carolina classrooms by awarding grants to teachers in grades K-12 for innovative, classroom-based projects that would not otherwise be funded.Since 1994, they have touched the lives of more than 2.1 million students who have participated in 10,400 Bright Ideas projects, and given out more than $10.9 million. Each year, close to 600 grants are funded across the state.